Terra Forming Terra: Quit eating bacon, ham and pork? I am no fan of our industrial approach to animal husbandry and this item lays out just how truly inhumane it all happens to be. Animal slaughter does need to be isolated as a standard matter of practice and it is not. As a result, as noted, the quality of the meat suffers and yes, obviously the animals suffer unnecessarily and that is what is wrong. Another huge loss is to agriculture itself. All our animals actively interact with the available land base and this is hugely beneficial. Sustainability means integrating the animals. We really do need goat herds, cattle herds and swine herds as well. These all need to be properly guided in order to maximize efficiency. Yet we are doing just this. We have not achieved fence-less fields as yet, but the advent of mind to mind management should solve just that as well as protecting from predators. This is how we did things in the Garden of Eden and will again in a restored Heaven on Earth. (Natural News) Start double-thinking that pulled pork barbecue sandwich, that BLT, and that slow-cooked ham. There are several reasons vegetarians and vegans don’t eat slaughtered animals, but one of those driving forces for many herbivores is the fact that animals have parents, eyes, feelings, emotions, and yes, intelligence. In fact, pigs are smarter than your pet dog and your pet cat, and outperform them on cognitive ability tests, coming close to the intelligence of even dolphins and chimpanzees. Just because pigs wallow around in mud, doesn’t mean they’re dumb or “dirty” animals. They do that to stay cool because they don’t have sweat glands. To the contrary of popular belief, pigs may just be the cleanest domestic animals alive, even more so than cats. As far as being intelligent, back in the 1990s, pigs were literally trained to use their snouts to manipulate a cursor on a video screen to distinguish between known scribbles and new ones. Plus, they performed this task just as fast as chimpanzees. Pigs have been known to outperform three-year-old children on cognition tests. Pigs are also more trainable than dogs. When pigs are jacked up with artificial hormones and toxic GMO animal feed (mutated Franken-soy and corn), their bodies and minds are poisoned, weakened, and their meat is toxic. All those chemicals rush through their blood and into their tissues when they see and hear their fellow beings being tortured and slaughtered all around them. There’s no way to cook out these carcinogens, no matter how long you fry that bacon or spin that hog on the rotisserie. In fact, overcooking meat adds to the toxicity, as well as when meat processing plants add cancer-causing and migraine headache causing nitrates, nitrites and monosodium glutamate (MSG). Most confined animal feeding operations in the United States are so filthy, nasty, and inhumane, that even if the most avid carnivores visited them, they may never eat meat again. Thanks to an almost week-long massive storm, enormous lagoons are now filled with infected, bacteria-laden pig manure (and rotting animal corpses), and are overflowing into nearby watersheds. Welcome to the United States of America, where the spread of food-borne illnesses run rampant, affecting millions of consumers every year. Nearly every factory farm in this country fuels the fast food industry, the restaurant chains, and the corporate-owned-and-run grocery stores and supermarkets. Excessive consumption of factory farm meat and dairy fuels pandemic-style diseases and disorders that barely existed in this country a century ago, including heart disease, cancer, diabetes, obesity, respiratory diseases, and infections bred and fed by parasites and pathogens. Humans who work in CAFOs (confined animal feeding operations) commonly suffer from respiratory diseases and outbreaks of E. coli and Salmonella poisoning. That’s why most conventional meat gets treated with bleach and ammonia at processing plants, before artificial flavors and fake coloring are added back in. Those figures are most likely low-balled. 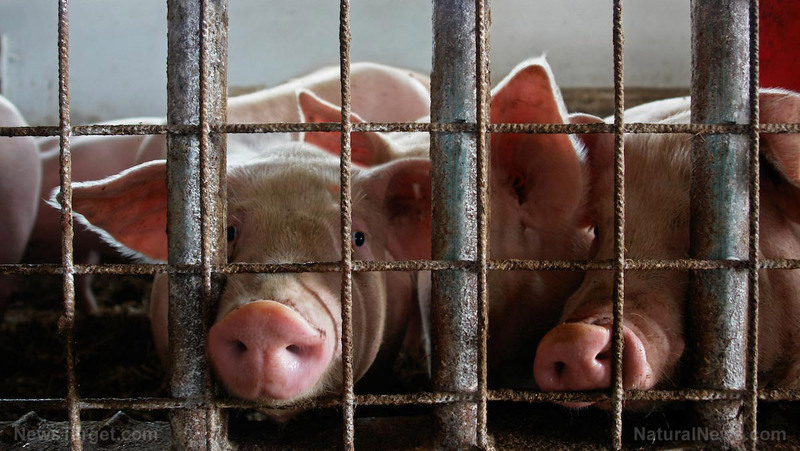 Animals that are trapped in crammed-up quarters, caked with their own feces, and suffering from digestive disorders and parasitic infections never heal. Animal waste is the main source of the spreading of Salmonella and E. coli bacteria. Plus, most CAFO animals (and their babies and chicken eggs) are exposed to pesticides regularly, adding to the tainted meat. Got polyps or colon cancer? Got irritable bowels? Suffering from dementia? How much meat do you eat? Some Americans don’t even consider it a meal if there’s no meat on their plate. From chicken biscuits to bacon-cheeseburgers, the diseases are spread from the filthy, diseased CAFOs right to the human gut. So, if you just “gotta” have that meat, stick with grass-fed beef, wild caught fish, and please, don’t support the CAFO madness of America, because that’s just flirting with disaster while saying yes to animal abuse. Think about your pet dog or cat next time you’re waiting in line at that Mickey Dee’s drive through. This has been a public service message from Natural News. Learn more about the food you eat at Food.news.